I’ve just done the first charcoal burn of the year. Turned out not bad. Half the load was pre-sold and it was a good outturn 13 hefty 5 kg bags and 20 handy 2.5kg bags, or, technically, big and little bags. One of the trickiest parts of making charcoal in a steel kiln is judging when to shut it all down by sealing out the air. Too early and the charcoal can be smoky when burning as all the tar hasn’t been burnt away and more brown ends are produced. Too late and you’ve burnt some of the charcoal away into the air. One way to judge the state of the burn is to look at the smoke. This smoke is dirty-coloured. 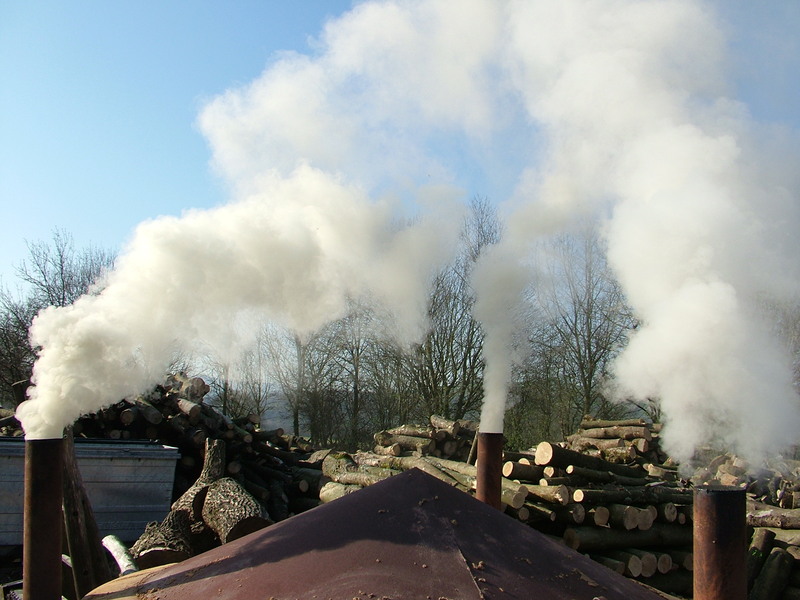 At the start of the burn the smoke is just about white as the wood’s moisture is driven off as steam. 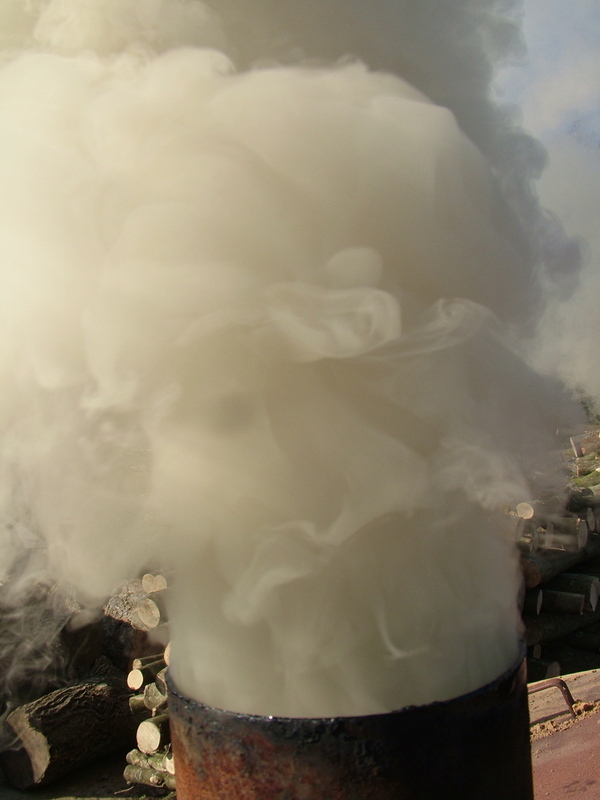 Then towards the end the smoke gets dirty as the built up tar burns and evaporates away. This is the sort of smoke you don’t want to inhale. Next comes the critical point. The smoke starts to clear a bit. However, if it is left too long at this stage and the smoke turns blue, then you’re loosing money as the charcoal production starts to go up the chimneys! Notice ruined Bolton Priory in the background? What a place to work! The final sign to heed is what is happening at the base of the air intakes. 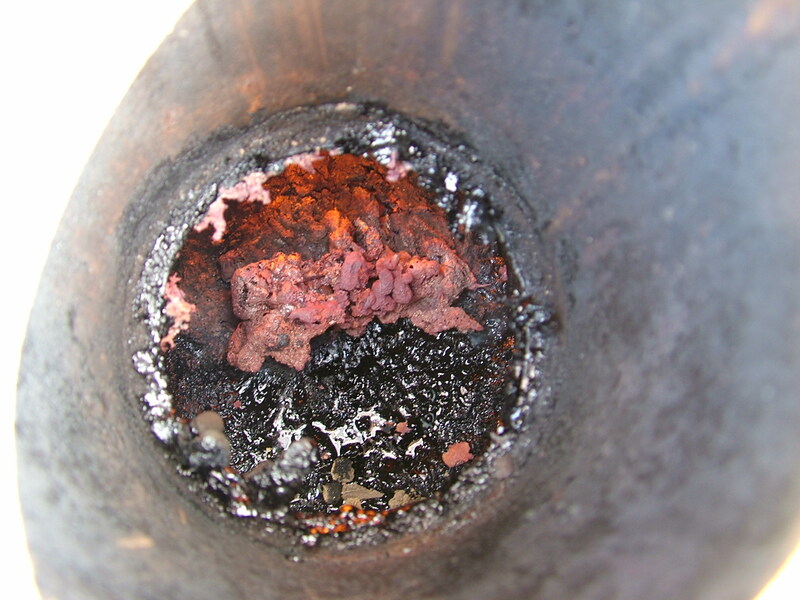 The tar can be seen burning a pink colour here and it’s about time to shut down. 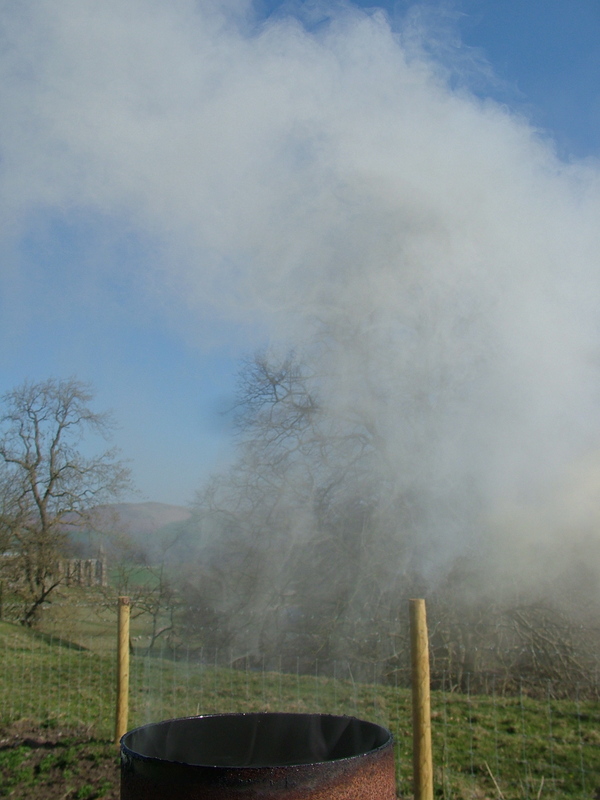 Theo and I delivered part of the bagged up out turn to Howgill Lodge caravan site and on the way we pass The Laund Oak. 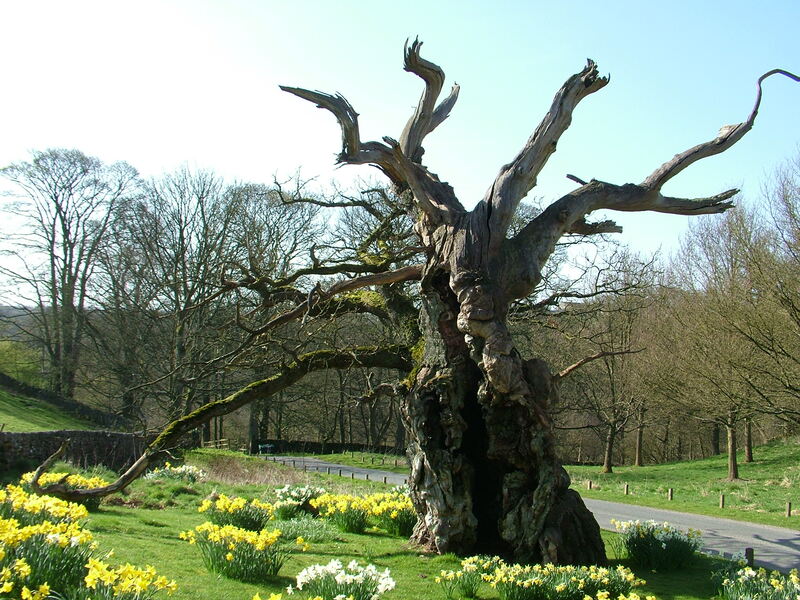 This is a veteran tree that used to mark the boundary between the forests of Barden and Knaresborough. You can see it’s a veteran from the hollow trunk, the massive girth and the dead limbs. There is still life in it though, its buds have not burst in this photo but there will be a modest display of oak leaves shortly. Interesting word Laund; it means a clearing in a forest where deer can graze, and the legal definition in England is an area where deer were raised, principally for hunting by the king and his cronies, and occasionally poached by us peasants on pain of severe consequences at the hands of the verderers, who enforced the king’s law in the forests. It’s a bit quieter in the forest today, and there seem to be about as many wooden deer produced as live ones. 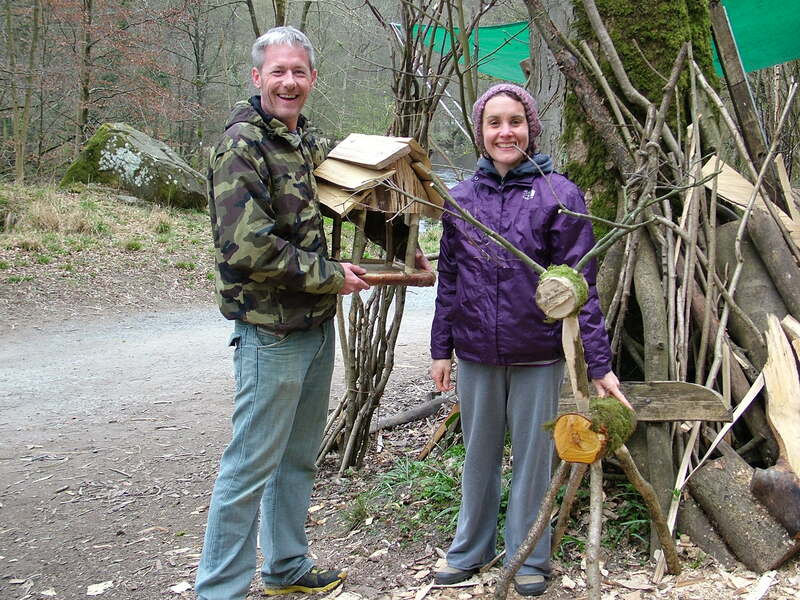 Here are two people, Jo and Andy, who came on a woodland course this week. This entry was posted in food, Green woodwork, hand made, wood and tagged Barden, charcoal, charcoal kiln, deer, Laund, smoke, Strid, veteran aok, wharfe, Wharfedale by Flying Shavings. Bookmark the permalink. Richard, a very pleasant read, thanks.